San Francisco 49ers' Colin Kaepernick kneels during the national anthem before an NFL football game against the Seattle Seahawks, in Seattle, in September 2016. 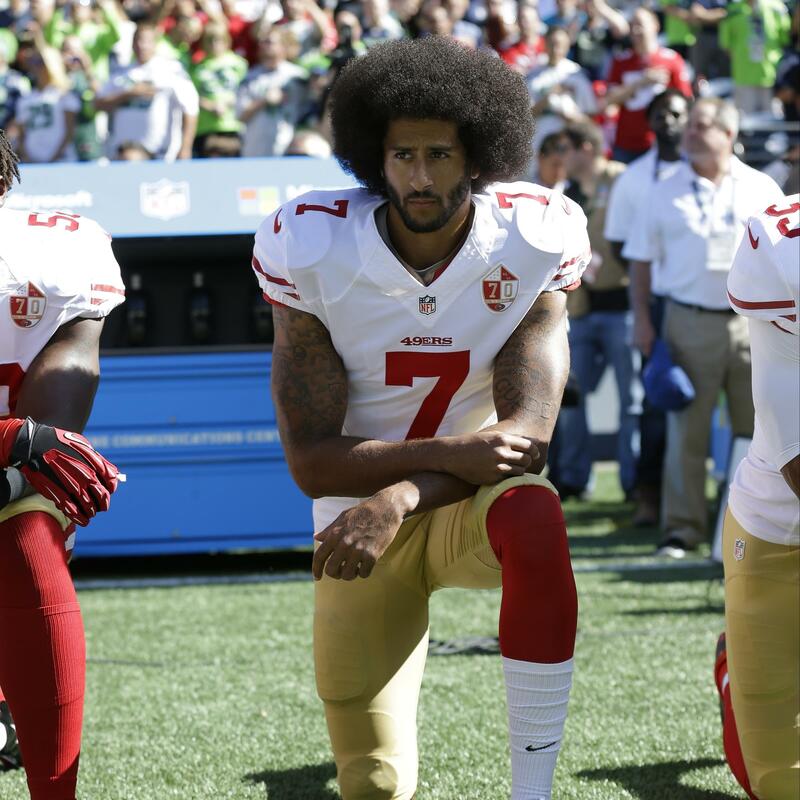 The former San Francisco 49ers quarterback, who first took a knee during a pregame national anthem in 2016 to protest police brutality, found himself without a team when he entered free agency after the season. The protests, which came amid a rash of police killings of unarmed black men, did not sit well with many fans and attracted the high-profile anger of President Trump. In October of last year, Kaepernick, who is now 30, filed a grievance against the NFL charging that owners conspired to shut him out of the league in retaliation for the protests. In a statement at the time, Geragos said, "Principled and peaceful protest ... should not be punished and athletes should not be denied employment based on partisan political provocation by the Executive Branch of our government." He accused the NFL of "collusive conduct." As NPR's Tom Goldman reported last year, Kaepernick — who led the 49ers to two NFC championship games and a Super Bowl — should have been a hot prospect as a free agent, bolstering the perception for some that he was being snubbed. Sports Illustrated described the decision to move Kaepernick's case forward as "a landmark ruling that substantially alters the complexion of the collusion grievance ..."
SI writes, "[If] Burbank concludes that 14 or more teams engaged in collusion, the [NFL Players Association] could acquire the option of terminating the collective bargaining agreement." Even so, as Tom wrote last year: "Collusion among NFL owners is hard to prove." The decision comes less than a week before the beginning of the new NFL season. The New York Times reported that the league "cannot appeal the arbitrator's decision to move to a full hearing, but it can appeal a final ruling." The Times says, "A hearing could begin by the end of the year, though the two sides could settle the case before then. Kaepernick is seeking damages equal to what he would have earned if he were still playing in the league."